Properly treated and cured cast-iron grill grates offer an efficient cooking surface because the material retains heat for longer periods of time than nickel-plated or stainless steel grates. Over time, however, cast-iron grates begin to show wear as protective grease-based coatings wear away and rust begins to show. Using brass or stainless steel wire grilling brushes in conjunction with proper cast-iron curing techniques restores cast-iron grates to their original nonstick luster. Cast-iron grilling grates need proper care. Close the grill's lid tightly following cooking sessions to keep the cast-iron grates warm while you enjoy your meal. Open the grill's lid and use a long-handled wire grill brush to scour away any food particles, char and excess grease from the cast-iron grate. Use long, scrubbing motions in the direction of the grill bars. Turn over the cast-iron grate using manufacturer-provided grate turners or long-handled pliers. Use the long-handled brush to scrub the bottom of the grate. Turn the grate right-side up. Use a small sheet of wax paper to smear a thin layer of vegetable shortening on the grate's cooking surface, which will keep the grate lubricated and rust-resistant between uses. Wear heat-resistant gloves if the grate is still hot. Preheat the grate for 10 to 15 minutes prior to the next cooking session to allow excess shortening to burn off. Some of the shortening will harden, providing a protective, nonstick coating on the cast-iron grate. 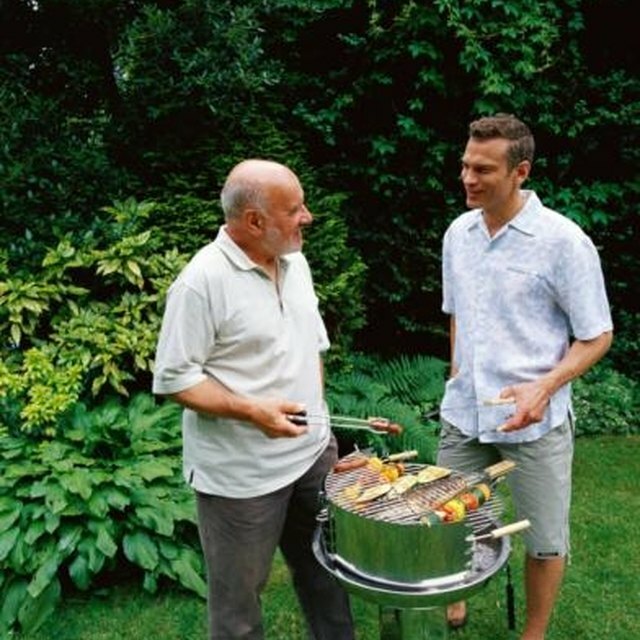 Keep the grill covered between uses to inhibit rust and other weather damage. To avoid burns, always handle hot grill lids and grates with protective grilling mitts or gloves and use long-handled grilling tongs or spatulas when removing or moving food.